Any time Peyton Manning is playing on our TV it makes for an interesting evening. As the stakes get higher, so does the entertainment value in watching Tammy, who lives and dies on almost every play involving Peyton. The stakes couldn’t be any higher for him — or her — when Super Bowl 50 kicked off Sunday night in San Francisco in what could have been the last game in Peyton’s storied NFL career. 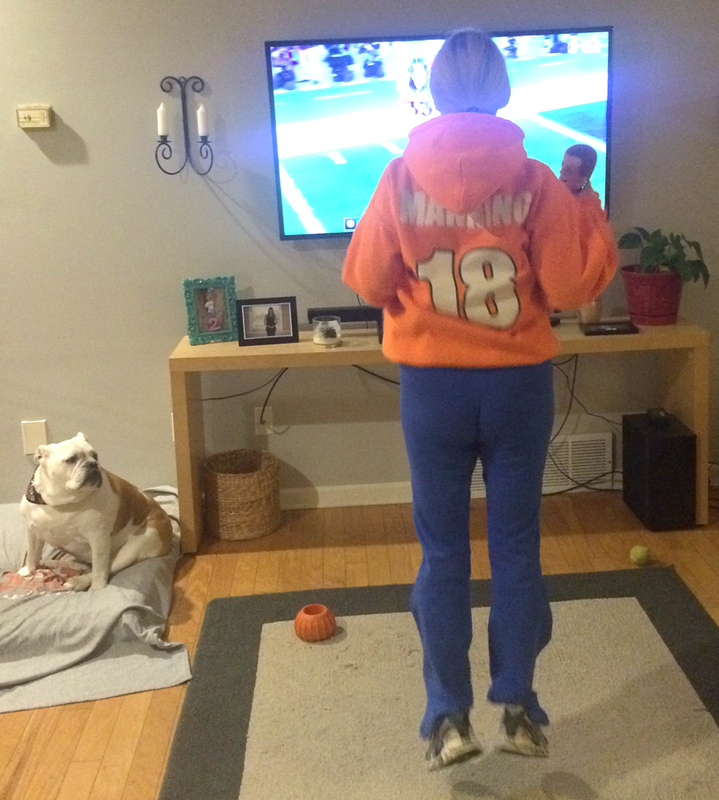 As I mentioned in my previous post, Tammy and I knew our only option was to watch the Super Bowl at home because it gave Peyton and the Broncos the best chance to win. There was an unspoken nervousness throughout the day. While both of us wanted Denver to beat Carolina, we both were worried about if the Broncos defense could handle Panthers QB Cam Newton. Tammy finally agreed to turn on the pre-game coverage about an hour before kickoff. 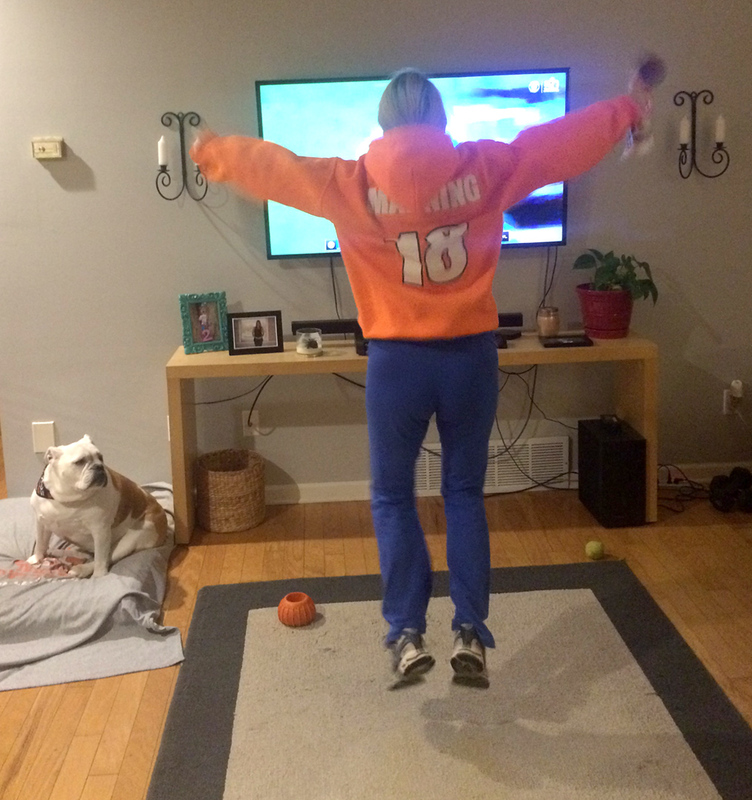 She already had on her lucky “This girl loves Manning” sweatshirt and was holding Lil Peyton while I made guacamole, checked on my white chicken chili in the crock pot, and put the finishing touches on a pizza before it went in the oven. 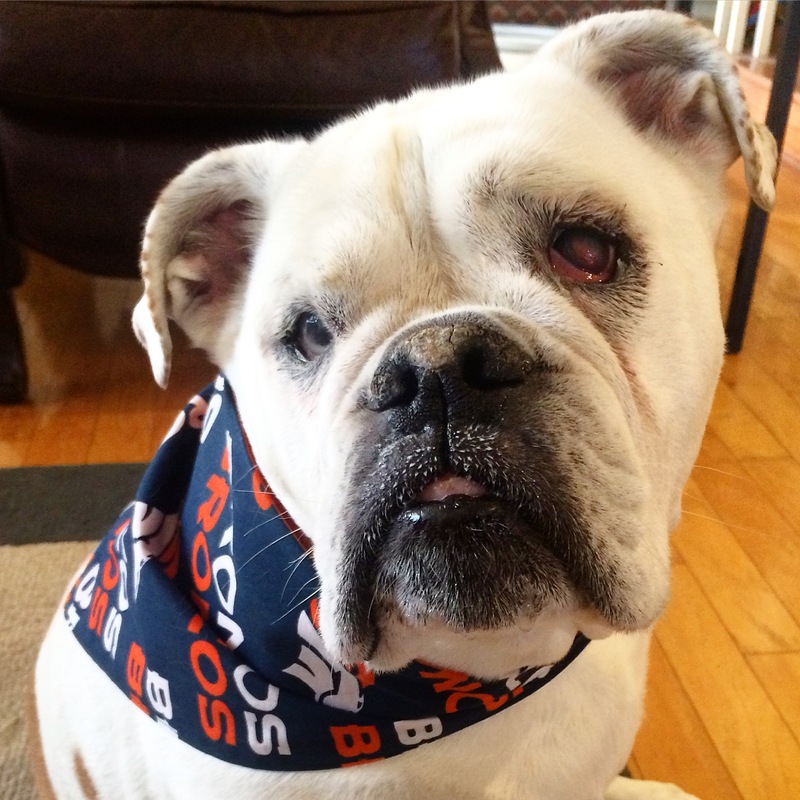 Even Savannah got into the spirit of things and showed her team colors with her Broncos bandanna. It didn’t take long for Tammy to wish she was watching something else. The guys at CBS went from making her cry (interview with Peyton) to making her angry (when most of the “experts” picked Carolina) in a matter of minutes. Her range of emotions was just a sign of things to come. Instead of spending all of my time on my laptop logging the time and constantly typing away, I decided to keep track of how many times Tammy said/did something throughout the game. A “By the Numbers” if you will. So, that’s what is below. Almost everything here was tracked DURING the game, although there are a few things that happened earlier. 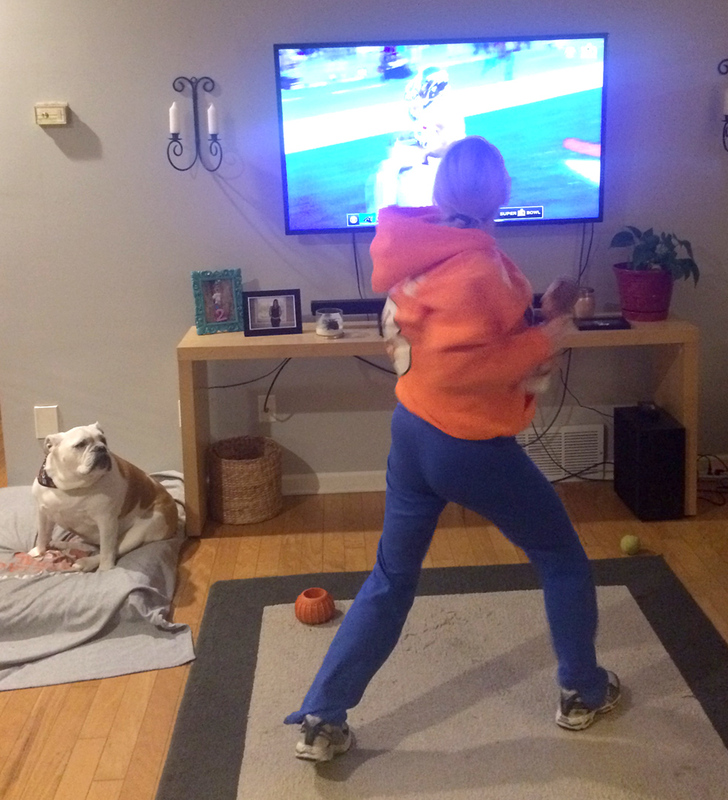 Enjoy this little taste of what watching Peyton Manning win Super Bowl 50 was like with Tammy. Times Tammy cried BEFORE kickoff. Times she said, “I hate him.” Once for Cam Newton, once for Tom Brady, which is surprisingly low considering her hatred for both. Tammy: I can breathe a little better now (with 10:47 left in first, after Broncos kicked a FG on its first possession. Tammy: This is gonna be a tough game. Number of times she took multiple deep breaths in an attempt to calm herself. These were all done before/around kickoff and stopped once the game got going. Fortunately for Tammy Denver played with a lead the entire game, which made it easier for her to actually watch. 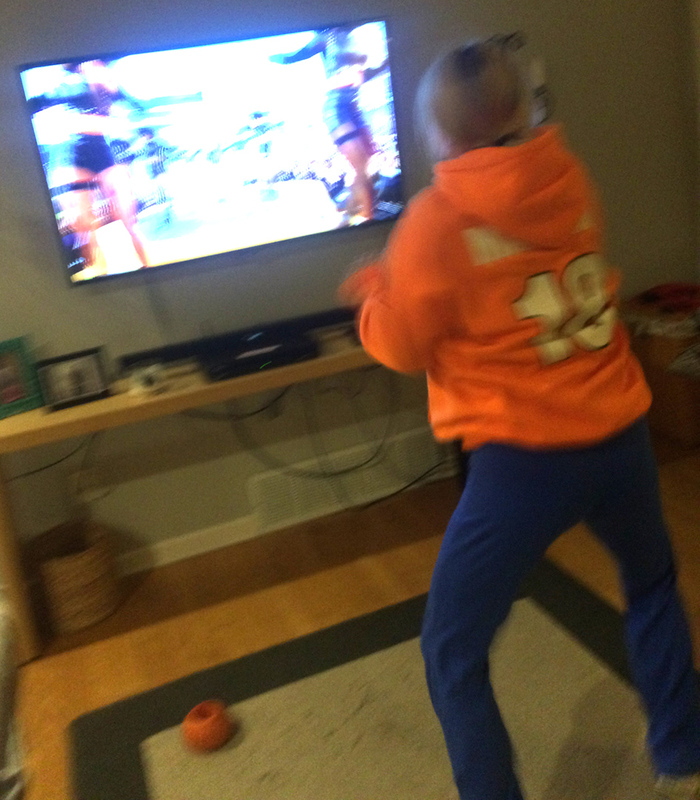 Times she jumped up and down in front of the TV when the Broncos sacked Newton, caused a fumble, and scored a TD. You can see Lil Peyton celebrating with her and Savannah not sure what’s happening. Times yelled, “GO! GO! GO!” during a play. Times Tammy BOOO’d at the TV. Most of the boos happened when they showed Cam Newton’s face, but Ray Lewis and Tom Brady also got one as well. Times yelled at the TV after a Broncos sack of Newton. Tammy: (pumping fist at TV) YEAH!!!! EAT GRASS CAM!!!! She’s been known to yell pretty violent things at QBs she doesn’t like. She once yelled for someone to “break his leg” when Michael Vick was being tackled. Times she hid behind Lil Peyton. Actually this number could/should be much higher because there were entire plays where she hid behind him. I just stopped counting. Times Tammy talked directly too Lil Peyton. Again, this could be much higher. Tammy: It helps when I rub his big head. Times she yelled “WOOOO!” Ric Flair himself would have been proud. 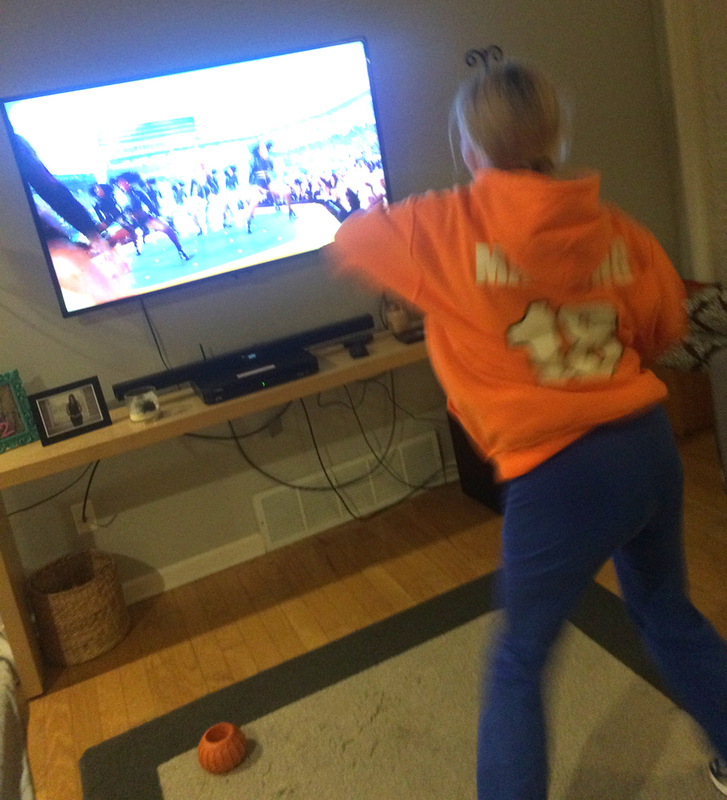 Times she yelled “YES!” This typically happened after a big play by Denver or a penalty against Carolina. Times she clapped. To qualify as an official clap, there had to be 4 consecutive claps. So just doing the simple math of the minimum claps (4) times the total number of times clapped (43) means there was a LOT of clapping going on. 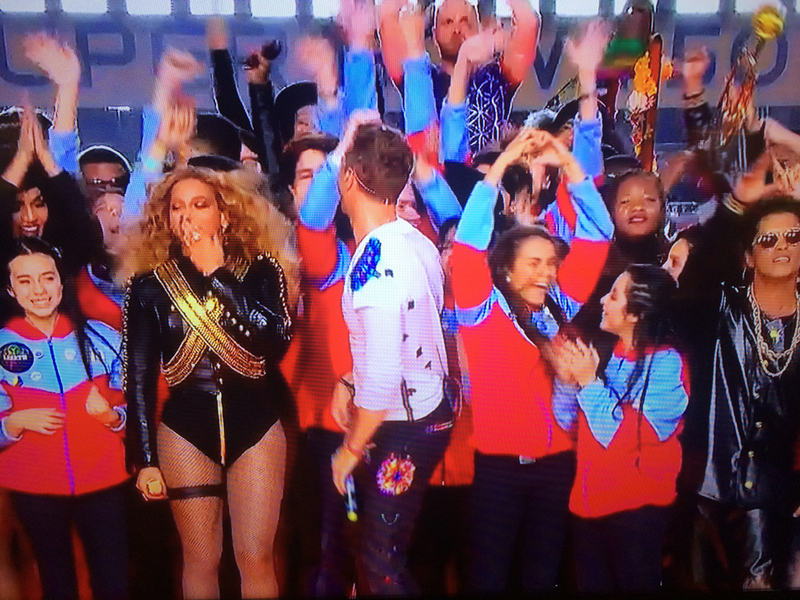 Minutes she danced along with the Bruno Mars and Beyonce. Minutes she danced to the Coldplay. Times she wondered why Beyoncé seems to always have a fan blowing on her wherever she goes. This pic doesn’t do it justice, but Beyonce’s hair was moving while not of the other girls around her did. Number of time she swore… during the first half alone! This is also another reason why we can’t watch the game with people. Tammy: Is it halftime yet, because I need a break. Total number of times she swore. She was slowed in the second half by the pizza. Tammy: I should be jumping, but the pizza was like lead. Number of times Peyton has won a Super Bowl when Tammy and I stayed home to watch the game. Peyton has only said that this may be his “last rodeo,” but I know that Tammy couldn’t have picked a better way for him to go out. Well, unless it was with him sitting on our back porch while he drinks a lot of Budweiser. Savannah congratulating Lil Peyton after the game. 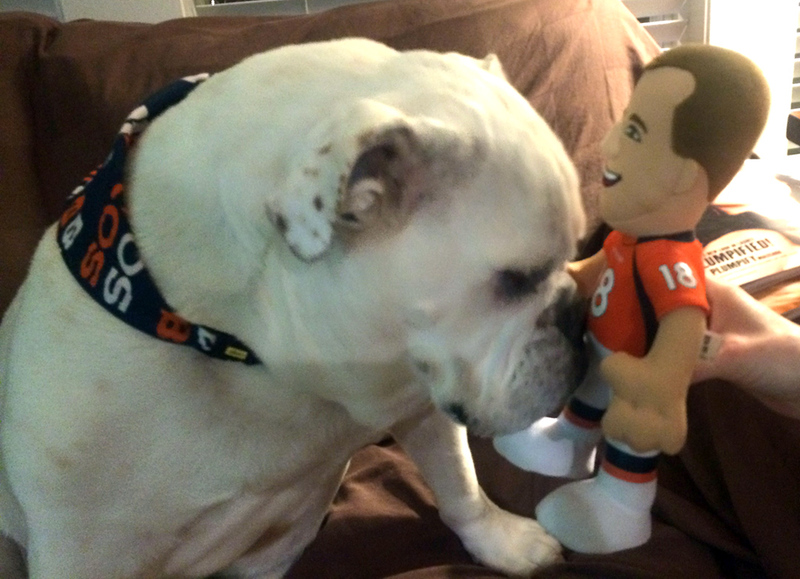 In her mind, Peyton isn’t coming back and she’s OK with that. The Broncos plane hadn’t even been warmed up after the game before Tammy was already thinking ahead. Tammy: What am I going to do next year? 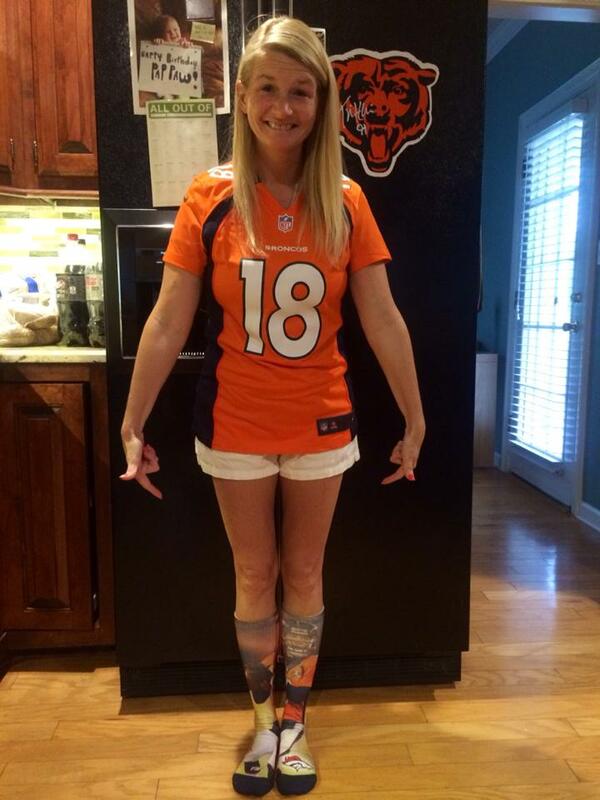 We’ll have to wait with the rest of the world to find out if Peyton will be back for one more year, but regardless of his decision Tammy has enjoyed every minute and snap of his 18-year career. But his snaps in Super Bowl 50 will always be her favorite. 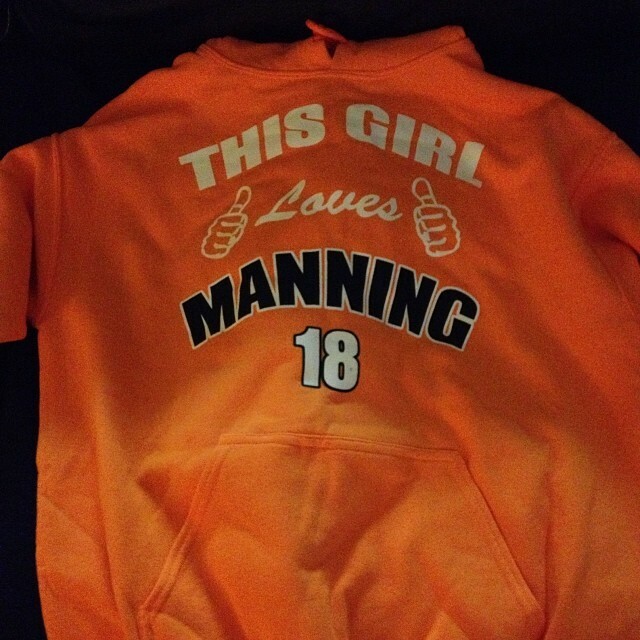 Not sure yet if she’ll let me wash her “This girl loves Manning” sweatshirt. 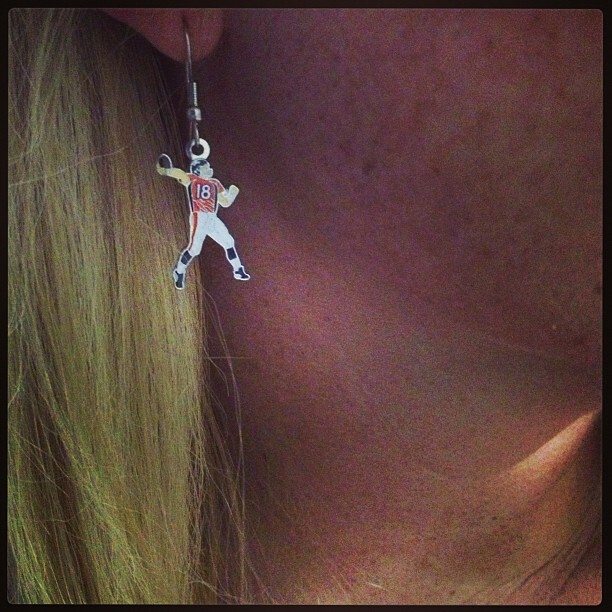 That may not be allowed until Peyton decides on his future. 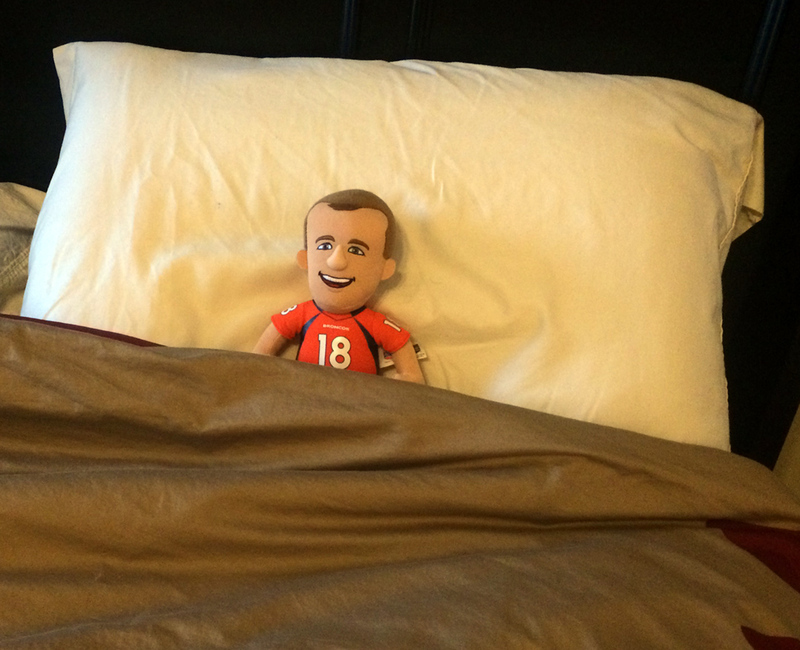 Lil Peyton was all tucked in on Tammy’s side of the bed this morning. After what all he went through last night he’s allowed to sleep in. Gallery | This entry was posted in Daily Life and tagged daily life, Football, humor, Music, people, Peyton, Peyton Manning, relationships, sports, super bowl, Tammy, TV. Bookmark the permalink.